I wish there were corporate libel laws. While it was a bit over dramatic, as someone who uses OOo in a corporate setting filled with requirements to be MS Office compatible I couldn't disagree with a single statement made. I don't think it's completely accurate to call it FUD. FEWT: "You are entitled to whatever backwards opinions you would like"
@Michael - Funny stuff thar. Articles like this, Jeff, are why I subscribe to your RSS feed. Most people are more comfortable with MS Office because no one has ever trained them on any software (and if they do, it's a 1 hour course), so they are only more comfortable because they've had to use it for so long. Trained employees are empowered employees. If you think about MS's position in the context of a political race, the first one to go negative is usually running scared ... I wonder how many of the "quotes" are legitimate? It is very possible for a Director of IT at a school district to not know the difference between open source and freeware. I work for one of the top 10 districts in the country, a previous IT director was (IMO) a political appointment without qualifications, though admittedly now fired. BUT ALSO, school districts are usually on the take with the Bill & Melinda Gates Foundation where they get large donations so long as they use it on MS software. It is like money laundering, but "charity laundering" where money officially sent out has to be spent on zero marginal cost goods and returned to the charity's founding company. I consider it FUD because trying to decipher the really obscure oomxl is the problem. Microsoft's unstandard. How about MS Office's unsupport for ODF? The same happens around here in Kenya. People are actually labelled computer-literate...while they are actually Micro$oft-literate. Am still waiting for when we'll have computer-literate and development-oriented talk instead of such hogwash by those crybabies in that skit. One of the great features I like in Open Office is being able to export to a PDF file. I do not see MSO giving its users the ability to do that. As many developers that Sun allowed to work on OO, they did a heck of a job and since OO forked to LibreOffice as it will have more developers than with OO and faster improvements. Why is it that the Anonymous folks are always the first to spread bad information and are the loudest in their anti Microsoft rhetoric? 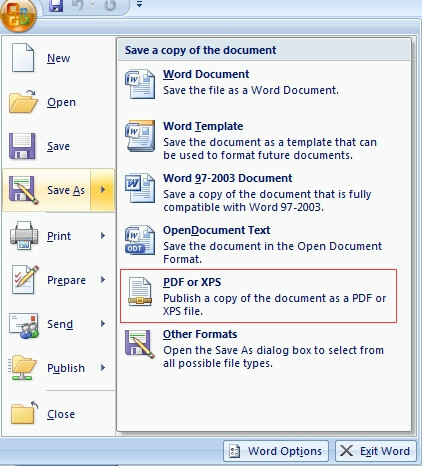 Office 2007 allows export to PDF, or XPS built in. See the clip from one of my virtual machines. Classic FUD! Not only is it FUD, the presentation style has been ripped off from a recent FORD pickup truck TV commercial (ie, all the big block letters popping into view and rotating the presentation area). That is SO Microsoft! They can't even be creative when producing FUD. Personally, I consider the FORD commercial to be absolutely tasteless (not that customers of big pickup trucks have any to begin with). But for MS to copy that style is an even greater comment on MS's complete lack of good sense. This message is based entirely on fear and innuendo. As an independent contractor, I personally used OO to edit documents, presentations, and spreadsheets for a large international plastics/chemicals company without ever receiving any complaint. And, btw, I also have extensively used MS Office. But I got tired of always paying a premium price for an incredibly average (at best) yet bloated software package. So I switched to OO. @FEWT What do you mean the loudest, I was stating that exporting to a PDF has been in Open Office and the ability to export to a pdf is new in Office 2007. I am one of those older people that started using home computers during the "great computer wars" of the early 1980s. It seems to me that *any* user should be able to sit down in front of *any* word processor, spreadsheet, or presentation software and just use the damn thing. It's not like they're using "Wordstar", LaTeX, or "Blender" it's just basic office productivity software. The only users that need to be trained on a particular piece of office productivity software should just turn in their computers and get a job peeling potatoes or something. Nice article, though I cringed at a few errors. There is an Open Office grammar plugin for that though. Oh, and a PDF import plugin as well. Sorry M$. We are coming to kill your cash cow. On a personal level, I am all OpenOffice.org (now converting over to LibreOffice) all the time, however at work I have to be a little more flexible. We use HP's QTP and Quality Center for automated software testing, and rely on Excel spreadsheets to feed our tests. Of course, this product suite is built on all MS products and requires Internet Explorer as well. Oh, how I hate ActiveX! Open Source is making progress. Slow and surely. Grass roots adoption will only get us so far before we really need to find a way to get people involved so that we can get the different software products marketed properly. I actually find OO.o easier to use than MS Office (which I've just finished training in) with one exception.... mail merge. While it is true OpenOffice has had problems, and I don't think anyone is expecting Oracle to turn all loving on it, there may be a change in the wind with LibreOffice. Large Linux supporters (such as RedHat and Canonical) have already stated LibreOffice will replace OpenOffice in their next release. This change in direction from the LibreOffice folks could be what has MS worried. Under Sun OpenOffice stalled and wallowed about. Now it may get the direction and drive it has been waiting for. This could be the start of some major improvements, and just what the open source office suite needs. I think it's unfortunate that people still think that familiar = intuitive/better product. I wish that today's corporations would stop spending their time and money trying to put their costumers in a prison of proprietary formats (ether software or hardware) and spend that time and money making a better product. You may have the ability to export to PDF in MS Office 2007, but it is NOT native. It's an add-in plugin. Yes, a free plugin and where I work has slipstreamed it into our MS Office 2007 installation package, but it's not native as you lead us to believe. Sorry BillH, that is untrue as of Office service pack 2. Really, it didn't even take 60 seconds to google this. "The 2007 Microsoft Office system already provides support for 20 different document formats within Microsoft Office Word, Office Excel and Office PowerPoint. With the release of Microsoft Office 2007 Service Pack 2 (SP2) scheduled for the first half of 2009, the list will grow to include support for XML Paper Specification (XPS), Portable Document Format (PDF) 1.5, PDF/A and Open Document Format (ODF) v1.1. When using SP2, customers will be able to open, edit and save documents using ODF and save documents into the XPS and PDF fixed formats from directly within the application without having to install any other code. It will also allow customers to set ODF as the default file format for Office 2007. To also provide ODF support for users of earlier versions of Microsoft Office (Office XP and Office 2003), Microsoft will continue to collaborate with the open source community in the ongoing development of the Open XML-ODF translator project on SourceForge.net." You guys are just slinging the same FUD that you are crying about Microsoft doing. It's silly. Learn the products before you talk smack, it might open your eyes to reality a little. "Everybody already knows MS Office. Change is bad, scary and costs money." I'm not saying it isn't true; I'm only saying that it is all I heard THEM say. I'm of the PERSONAL opinion that at the very least public universities, schools, etc. should be required to standardize around open formats, not proprietary ones. NOTE: I didn't say open software! I said open FORMATS. LibreOffice IS going to make a difference. It incorporates Go-OO which has significantly better MS Office compatibility. I've recently made the switch and am quite pleased. As far as the video goes, the quotes seemed to be from just a couple of organizations if not people. 3 incompetent IT staffs don't make a very convincing argument to me. Further, I would say it's just as valid an argument that those people that breathed a collective sigh of relief were probably incompetent in their use of Excel and Outlook as they were with OOo. Total FUD. I used to be in advertising and can tell you that it's total FUD. If you listen closely to what is being said, there's no corrolation between cause and effect. It's just a random stringing together of made up stats which was meant to be taken out of context to create fear.